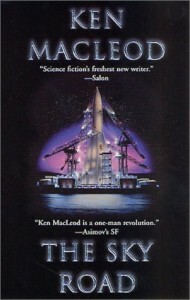 The final Fall Revolution book is “The Sky Road”, another sequel to “The Stone Canal”. Confusingly, it takes place in an alternate universe to “The Cassini Division”. Despite being set in the same time frame, Earth is radically different and the events in “The Cassini Division” haven't happened. Having focused on libertarians, capitalists and communists in previous books, “The Sky Road”'s dominant political ideology is that of extremist environmentalists. They believe that reliance on technology led to the disasters of the 21st Century, and have established a more peaceful, parochial world in which most technology has been banned. There are again two plot threads, one focuses on Myra, an associate of Jonathon Wilde and David Reid who came to control a small state with a large nuclear capacity in the mid-21st Century in a plotline connected to the 21st Century portion of “The Stone Canal”. The other focuses on a naive young man named Clovis, who resolves to investigate the life of Myra the Deliverer, by his time a major historical figure. Clovis works on a large project to build the first space ship in centuries, an endeavour that may require use of previously banned technology to pull off successfully. This spaceship is being constructed in Scotland (near where the Skye Bridge now is, hence on the Skye road), conveniently close to Myra's old haunts in Glasgow. Clovis takes a trip to investigate any traces of her life, despite the occasional disapproval of the authorities. Again this is a well-written novel, with some beautiful pieces of prose and plenty of clearly explained ideas. The characters are perhaps more likeable than in previous books, particularly in the far future section. The more distant of the two future eras is the more interesting of the plot threads, with the other plot being very reminiscent of the corresponding section in “The Stone Canal”. If there is one thing to criticise, it is that the plot lacks impetus, there isn't such a sense of tension as in previous books and occasionally the plot seems relatively prosaic. In summary, a well written book (again), that is entertaining but not quite as ambitious as the previous books.